The AuditMaster is an expert sprinkler performance testing kit, helping to maximize water savings by accurately measuring sprinkler application rates. Increasing watering times to compensate for poorly performing sprinklers wastes a lot of water. The AuditMaster LT Kit is optimized for golf courses, sports fields and other large turf audits. 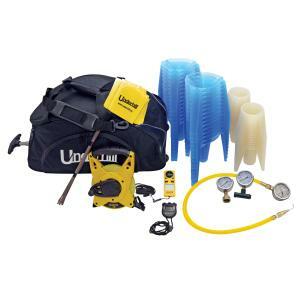 It is an all-in-one pack that includes all you need to get the most out of your irrigation system in a convenient portable kit. Catch Can Pro water cups are self-standing and easily anchor into the turf or on adjoining slopes. Constructed from durable polypropylene, the efficient design allows for shorter test times. Catch Can Pro cups measure sprinkler application in Inch or centimeters and can be stacked for easy storage. The kit sets up quickly and results are typically determined the same day.